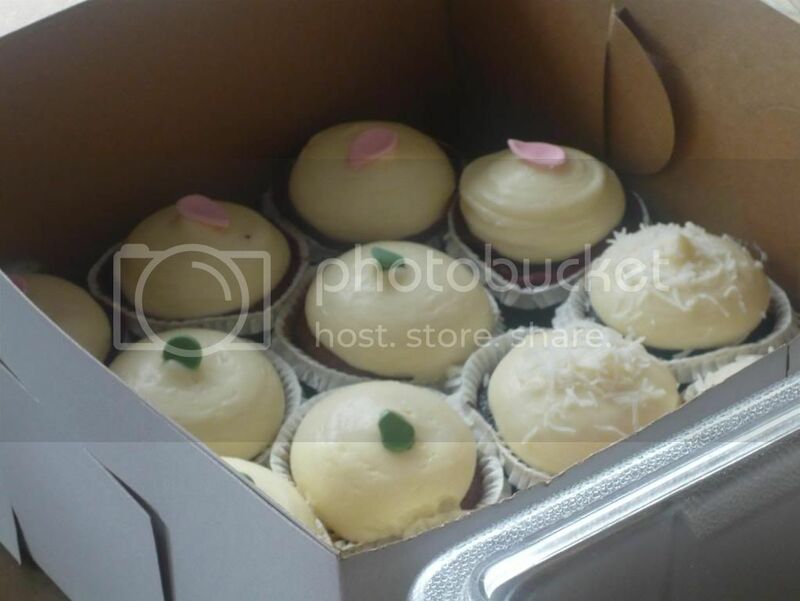 I recently revisited Sun Basket, a recipe kit delivery service that also offers gluten-free, paleo, or vegetarian plans. 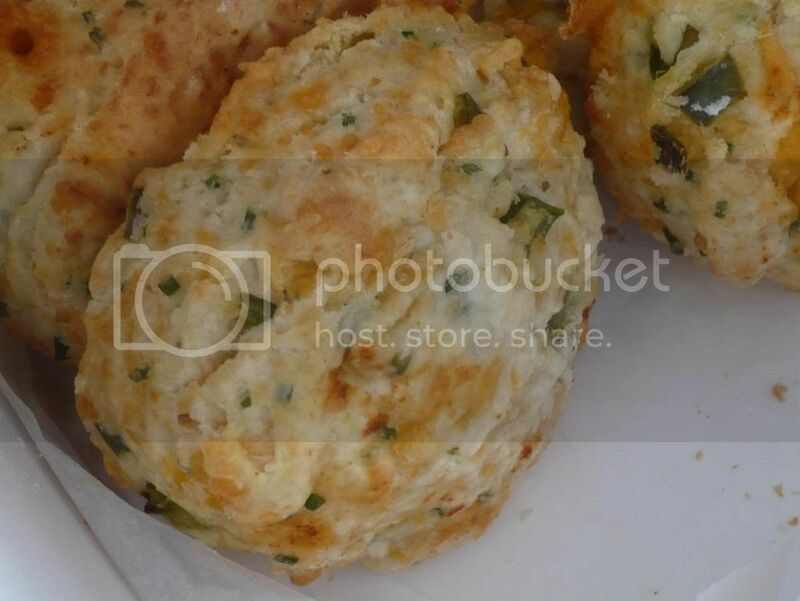 I tried Sun Basket before a couple of years ago, but felt that they have improved quite a bit recently with much more interesting and well balanced recipes. The current recipe offerings are much more interesting, with recipes spanning multiple cultures that are relatively authentic (to a point), easy to cook, and tasty, like this dan dan noodles that I got in my box. Sun Basket also claims to use organic and sustainable products. Sun Basket costs $11.99 per serving if you do the classic menu, which comes with 3 recipes for either 2 or 4 people each week with 18 recipe choices. With the family pricing, it's $10.99 per serving for 2, 3, or 4 recipes for 4 people with 6 recipe choices. If you live in Boston, I'm sure you've visited the Boston Public Market, but did you know about The KITCHEN at Boston Public Market at the back of the market? The KITCHEN is managed by The Trustees, one of the largest owners and steward of agricultural land in Massachusetts and a founding member of Boston Public Market. 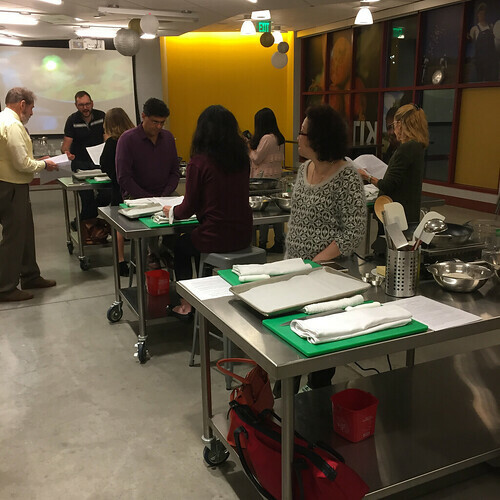 The KITCHEN frequently holds hands-on cooking classes and educational experiences that highlight New England farmers, artisans, and chefs. 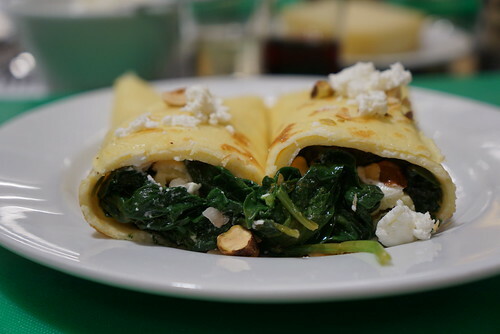 I recently got to attend a crepe making class with Saltbox Farm and the chefs from Saltbox Kitchen, their farm cafe in Concord, MA. Since my mom was visiting me from Indonesia I took her along for the class. Each table can fit four people and equipped with our own cutting boards, one induction stove per table, and the ingredients for our menu. 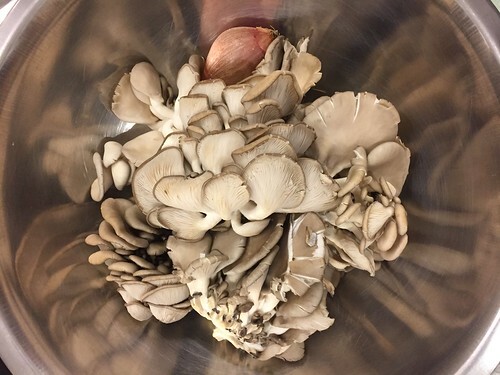 The ingredients for The KITCHEN's cooking classes all come from the Boston Public Market, including some gorgeous oyster mushrooms for our crepes. 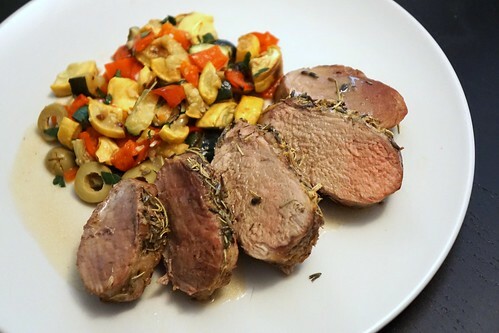 I recently tried a new meal kit service called Pangea Nutrition. Pangea Nutrition is started by two Boston-based doctors. Dr. Christos Mantzoros (Professor of Medicine at Harvard Medical School, as well as Director of the Human Nutrition Unit of the Division of Endocrinology Diabetes and Metabolism at Beth Israel Deaconess Medical Center) and Dr. Jason Paruthi, who completed his residency at Harvard Medical School as well as entrepeneurship courses at MIT Sloan School of Management. They combined their medical and nutrition knowledge with the entrepreneurial streak in Pangea Nutrition. Pangea Nutrition abides by the Mediterranean diet to make it easier for people to adopt this healthier lifestyle. 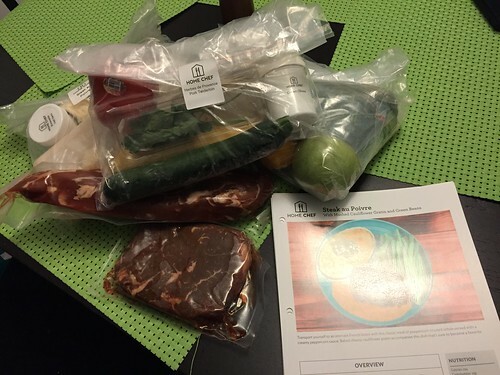 Different from other meal kit services, Pangea Nutrition actually utilizes Amazon Fresh for their deliveries, while the recipe cards come separately in the mail. 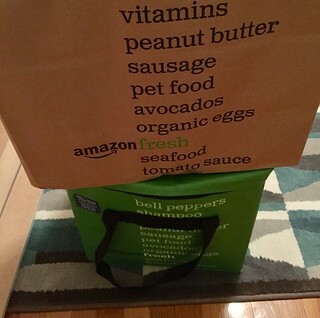 This means you can get Pangea Nutrition if there's Amazon Fresh service in your area. Truth is, I would be cooking more if I don't have to wash so many pots and pans after preparing a meal. Recently, though, I tried something that helps cut down on dirty dishes. The Ready. Chef. Go! bags are steam cooking bags that make cooking easier. As you can put all the ingredients and cook it in the bag, you eliminate the need to use and clean pots and pans. 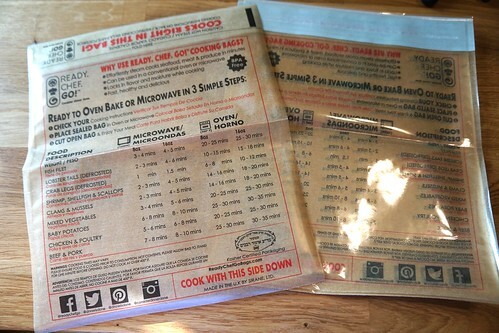 Each bag can hold 1 lb of food and the cooking directions for different proteins or vegetables are printed on the bag for easy reference. 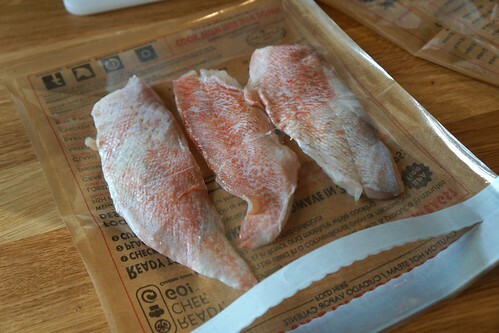 Start with 1 lb of white fish filet, split into two Ready. Chef. Go! bags. Back with another meal kit delivery service review! 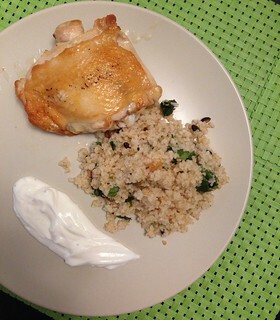 I recently got to try another service called Home Chef. Home Chef is an ingredient kit service based out of Chicago and currently deliver to 60% of the country. Just like Plated and Hello Fresh, you can choose your specific meals. Each meal is $9.95 per serving (each meal serves 2), and delivery is free if you order $40 (otherwise, delivery is $10). If you get delivery, which you would with 3 meals for 2, Home Chef comes out to be cheaper than Plated or Hello Fresh. Also, you can Join Today & Enjoy 3 Free Meals . They have at least 8 meal choices each week and they're clearly labeled with food restrictions like "gluten-free", "nut-free", "low calorie", etc. I also like that they have breakfast meal options, too, which are also cheaper, so you can get 2 dinner meals and 1 breakfast if you choose, to meet your $40 minimum. 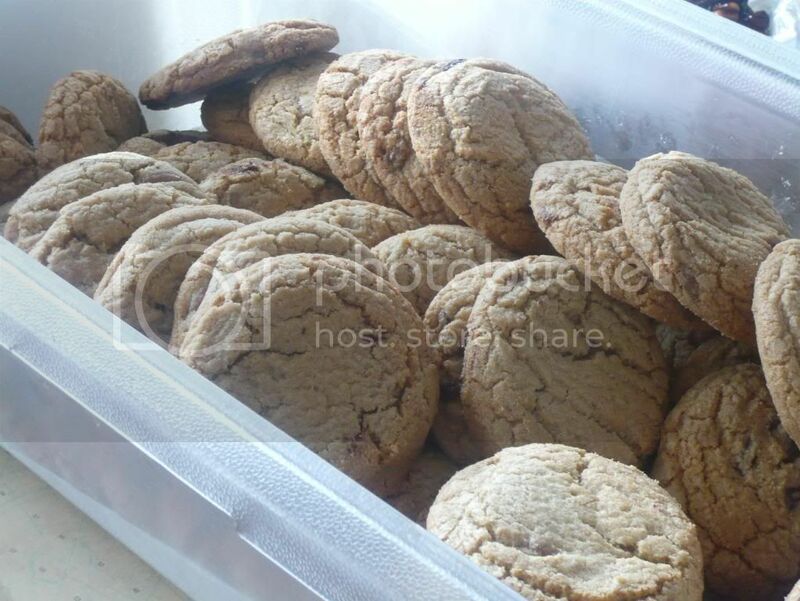 Home Chef is a subscription service, but you can adjust the number of recipes each week. Patina's Cafe Pinot is holding a monthly Art of Charcuterie class with Chef Joe Vasiloff. 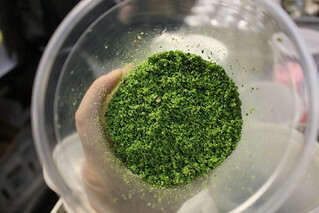 Each month's class is different, and last month we learned how to make duck breast prosciutto and duck rillette. Here's the recipe for the duck rillette! Combine all ingredients in a food processor and pulse to a super fine consistency, so it resembles the texture of white sand. Step 1: Trim the duck legs of any excess fat that that extends beyond the flesh. Optional and as learned in class: around the base of the shank, cut around the shank, through the skin and tendons until you reach the bone. I've written about Plated's meal kit delivery service before, but lately I've been using HelloFresh more. The reason is simple: it's cheaper. Plated runs about $12 per meal while HelloFresh runs about $10.75 per meal (both of those prices include shipping). Plus, you can get $40 off your first box when you use code 72CQCJ. With these snowstorms in Boston, it's always a relief to you know you've still got plenty of food to cook at home! Just like Plated, you can choose the exact menu items you want from that week's selection. The only difference is while you can order 2 meals for 2 people at Plated, with HelloFresh you need to order 3 meals with 2 people. That might be how they can charge a cheaper price. 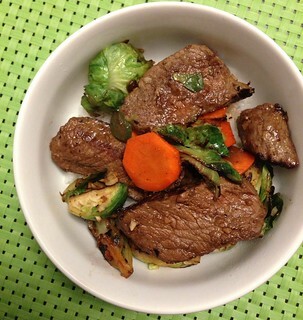 I've ordered three times now and tried quite a few things, but I always try to order the simpler recipes like this beef and brussel sprouts stir fry. 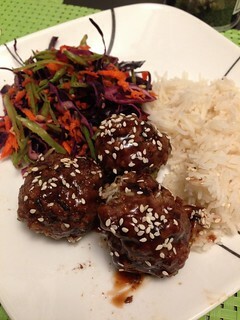 Teriyaki meatballs with carrot and pea salad. This was my first time making meatballs! I had to roll up the ground beef by hand, but hey, I did pretty well if I do say so myself ..
Sure, I don't cook much, but I'm partially a biologist and I can follow protocols ... I mean, recipes ... That's why I use services like Plated when I'm not going out. With Plated, they send you exact ingredients and recipes, expecting you to only have olive oil, salt, and pepper in your kitchen. Pretty much what I have! Plated isn't dirt cheap - each meal costs $12 with subscription or $15 a la carte. I have a subscription and you can just skip the weeks you don't want a delivery (which is 80% of the time for me). If you order more than $50, then delivery is free. But given the price, I have to say the food I've made using Plated have tasted quite good, if I do say so myself! They recently added dessert options, apparently. 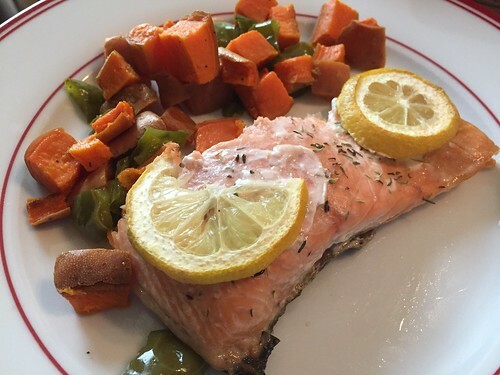 Fresh Dish is another "meal delivery service", but it's a bit different. Instead of sending you prepared meals, they send you meal kits that you can cook/prepare in 30 minutes. They run from $8-12 per person ($32 for a meal for 4 or $24 for 2) and they've included everything in the kit, from the big ingredients to small packets of salt and pepper. The meats and vegetables are raw, and most things are already pre-measured in their own containers. The fajita was super easy to make. Just season the meat with salt and pepper and cook on both sides. The tortillas just needed some heating up and then all the toppings like guacamole and salsa were already prepared. The most labor I had to do was probably slicing the steak up. On Video: Make Jalapeno Chocolate Mousse with Chef Ludo! Before I start blogging about LA Mag's The Food Event that happened yesterday, I thought I'd give you guys a sneak preview. Well, I know you all would want to see this, so here you go: Chef Ludo showing you how to make his spicy jalapeno chocolate mousse, "good for Valentine's", and talking about French girls. Oh and sorry about the cuts, my arm got tired. 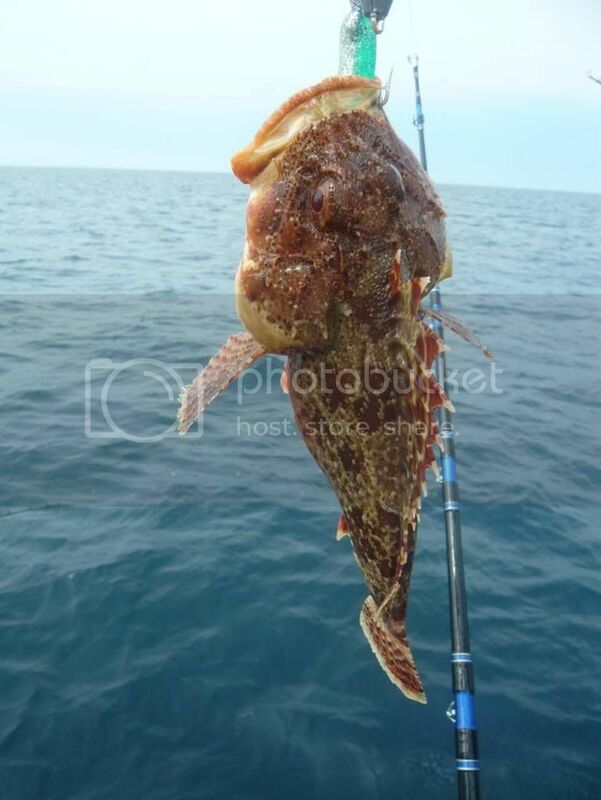 Fishing with Cimarusti and Citrin, plus Battle Scorpionfish by Choisauce! I found out $100 can get me on a boat and fishing with Chefs Michael Cimarusti (Providence) and Josiah Citrin (Melisse) (thanks to Diglounge's twitter update). Did I take it up? Hell yeah! 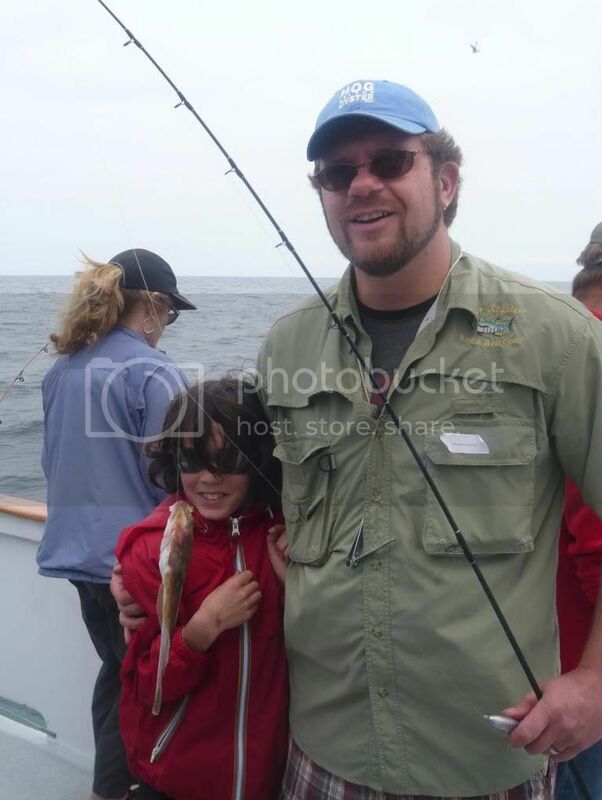 This fishing trip is organized by the quarterly magazine Edible LA. 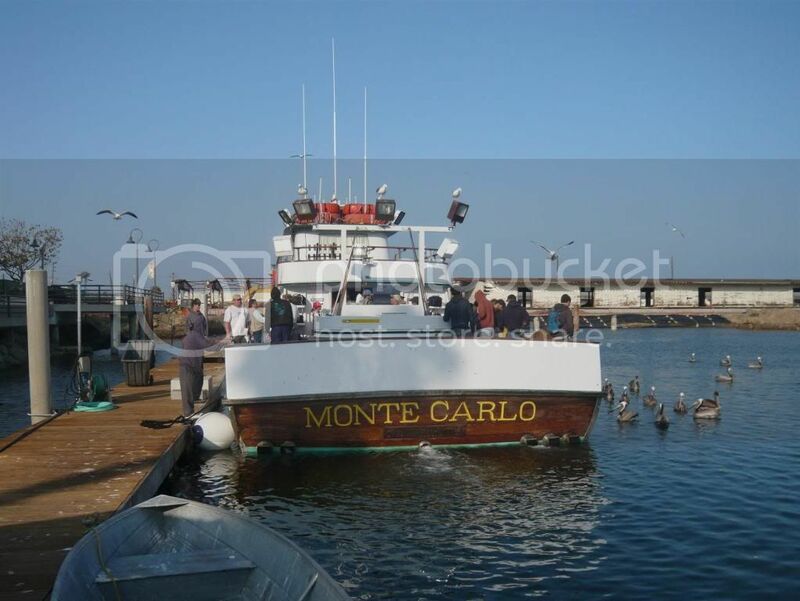 The weekend after my big exam I took my new fedora hat and drove down to San Pedro, rented my fishing pole and got on the Monte Carlo boat. I never realized how much work fishing is until I got my first catch. I mean, throwing it and waiting for the fish to bite is easy enough. But man reeling that fish up from the bottom of the sea is hard work!! What the ... I had no clue what it was. And man was it ugly! Apparently it was a scorpion fish - the scales are poisonous but they clipped all the scales for us before putting the fish in the bags. Well, ugly or not, those babies are all I caught that day. All seven of them. Other people got sand dabs, groupers, eels .... but I guess the scorpion fish like me. 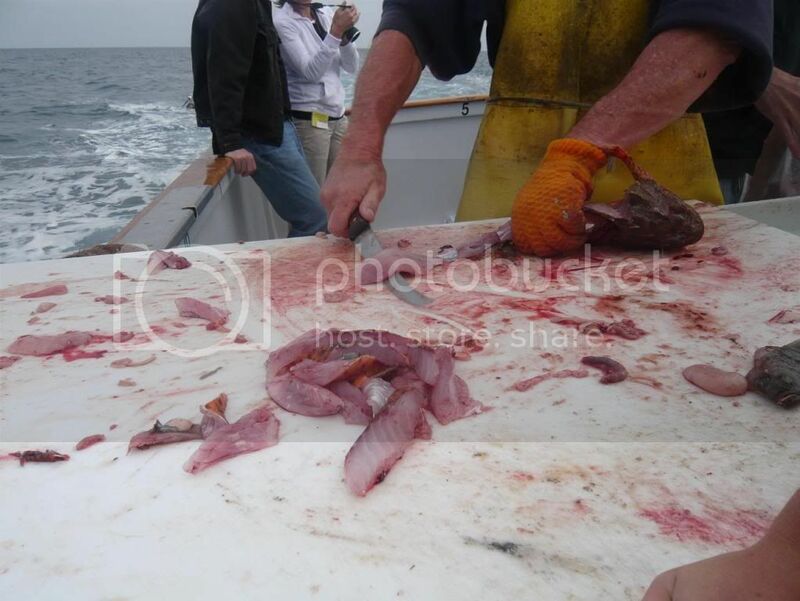 So there I was with a bunch of scorpion fish, filleted and whole, in my canvas bag. I had no clue what to do with them, besides deep frying (cos deep fried anything is like, yum). Chef Josiah Citrin suggested deep frying them whole. OK, can do. 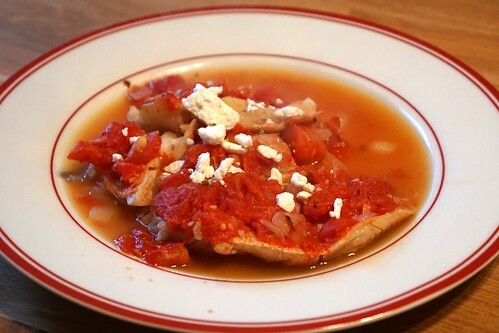 Chef Michael Cimarusti said they were great for bouillabaise. Yeah .... I wasn't about to make bouillabaise. I wasn't about to eat 7 deep fried scorpion fish on my own either. So I called the chef Choisauce to prepare these fish whichever way she liked :) Well, okay, so my first message just asked if she wanted fish for dinner ... but I think she understood that she would need to cook them haha. And thus Iron Chef Choisauce: Battle Scorpionfish began. My kitchen being a pathetic kitchen with no seasoning, Choisauce's original Korean fish soup turned into a Cajun-seasoned fish soup, but she's such a good cook that it was delicious anyway! 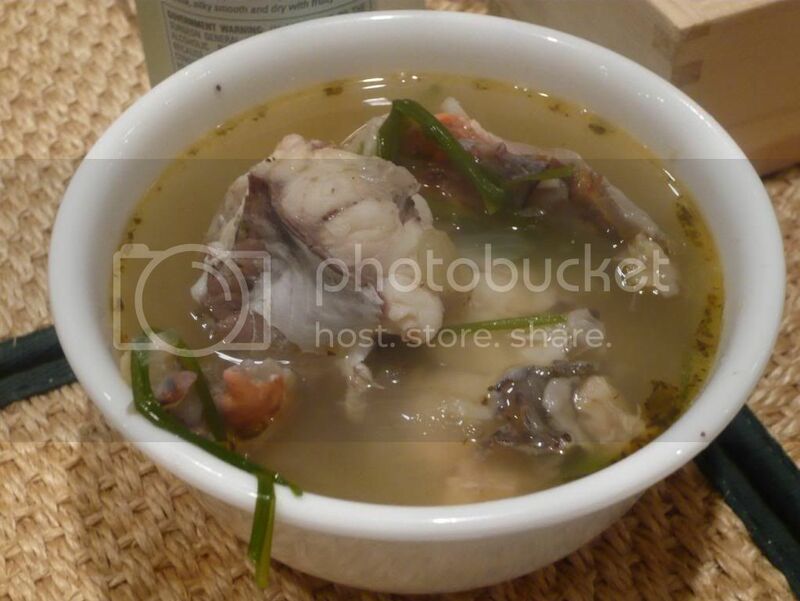 The scorpion fish is a meaty fish, and here it's nicely accented with the garlic/lime broth. 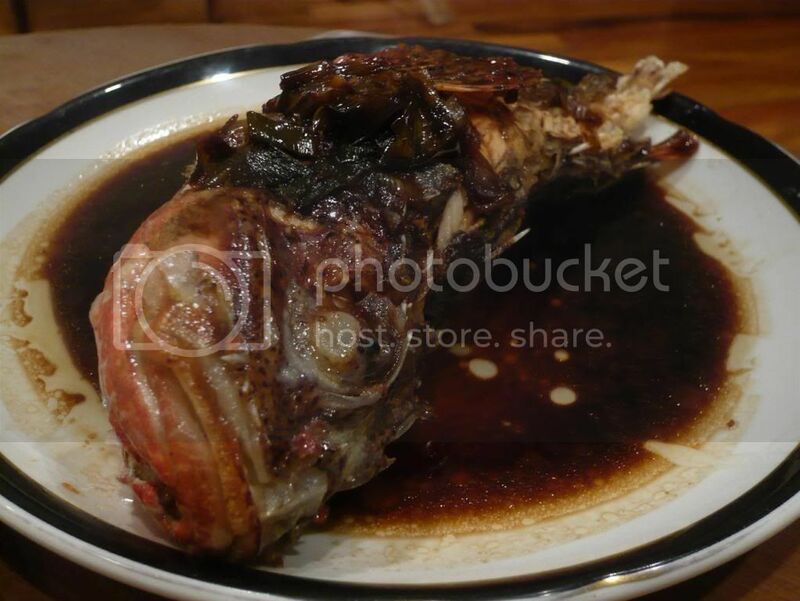 Next up was the deep fried whole fish, served with Choisauce's special impromptu sauce. (I helped fry the fish! See I cook after all ... not :P) Can't go wrong with deep fried fish, for sure. 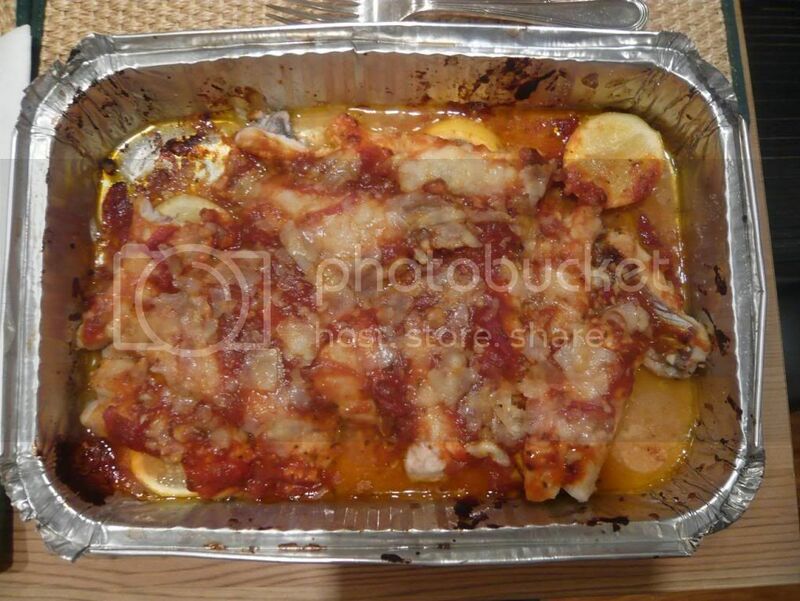 Lastly, the fillets that we had were baked with lemon and tomato sauce and cheese. Turns out scorpionfish is pretty good filleted and baked. It's hard to say which one was our favorite since everything was so good. The baked fillets were easiest to eat so we cleaned that up. We also cleaned up the fried fish and the soup leftovers made a delicious lunch for me the next day. Thank you Choisauce for the delicious, delicious meal!